Monique Billings drives against Ruthy Hebard in January, as Jordin Canada looks on. Photo by Kristie Hoang. The logjam at the top of the Pac-12 Conference will dislodge sometime this week. But which way it will shake out is anyone’s guess. No. 7 UCLA, No. 9 Oregon and No. 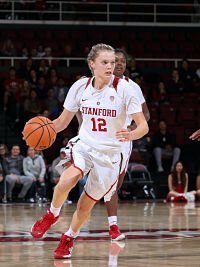 14 Stanford are all sitting on 12-2 league records, and have been tied for almost two weeks. 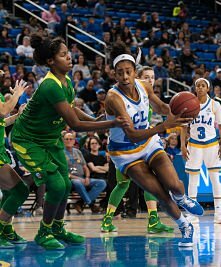 Monday UCLA takes on Oregon in Eugene, after they face off with No. 15 Oregon State, third place in the conference at 10-2, Friday night. Both of the host schools will be gunning, for different reasons. The Bruins routed the Beavers in their first meeting of the season, Jan. 5, so they will seek redemption. The Ducks closed out UCLA two days later, on defense and hustle plays. Now they not only want to win the series, but climb back into the Pac’s top spot, which they had all to themselves until recently. The series will be all the more intense because Oregon State and Oregon boast the Conference’s top two attendance averages, respectively, and those crowds are known for being vocal and hostile to opponents. Stanford, in the meantime, faces Bay Area rival Cal twice this week. The Bears had a strong start to the season but have lost four of their last eight games, so it is likely that the Cardinal will win both games. Stanford owns the tie-breaker in the race for first place in the league, as they have beaten both UCLA and Oregon. The Bruins and Ducks were picked to battle for the regular-season title, and Stanford was nowhere close to challenging for the position to start the year. They were 7-6, with one of the worst starts in program history, and fell out of the AP top 25 poll for the first time in 17 years in December. Brittany McPhee has ignited Stanford on a winning streak since her return from injury. Photo courtesy of Stanford Athletics. It is not an unfamiliar position for Stanford. They were not picked to win the Pac-12 title last season, but finished one game out of the running and went on to win the conference tournament by upsetting the favorites, Oregon State. Pac-12 schools know better than to count out a team coached by Tara VanDerveer, who has had the position for almost 33 years. The Beavers are especially tough at home, and the Bruins lost there last year. But if they win this time, it remains to be seen who will come out on top Monday night: the young, star-studded Ducks, or surging UCLA with their hungry senior program-changers? Oregon, at 23-4, has the best record of all three teams, and were ranked No. 6 early in the year, due to the fact that their only two losses came to top five teams. The Ducks became mortals again on Jan. 19 when they lost to Oregon State on the road, which coincided with the loss of starting shooting guard Lexi Bando to injury. Stanford beat them two weeks later, which remains the lone home loss this year for the Ducks. This past weekend saw Oregon sweep the Washington schools on the road, and Bando returned for their second game to score nine points off the bench in 12 minutes. She is restricted to 10-12 minutes per game, but her efficiency and the way her presence affects the Duck lineup means that they have almost fully regained their potency with her return. The Bruins are on a roll, and have won ten straight games since losing to Oregon Jan. 7. 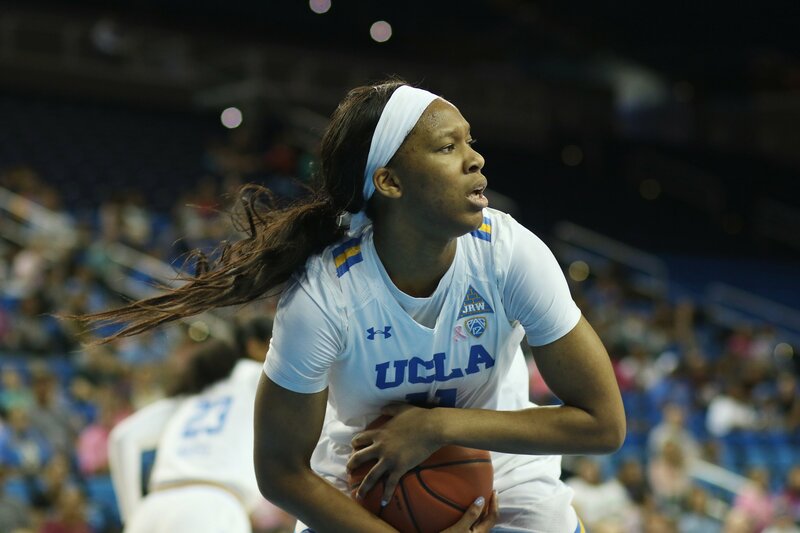 Point guard Jordin Canada and forward Monique Billings – who are both projected to be first-round WNBA Draft picks in April – have done their usual damage. It is the elevated play of starters Lajahna Drummer and Kelli Hayes that have made the difference for the team of late. Lajahna Drummer secures the rebound. Photo by Maria Noble/WomensHoopsWorld. Drummer has had five double-digit rebounding games this year, including a career-high-tying 14 two weeks ago. Two of her three career double-doubles have come in the last two weeks, and she’s pulled down at least six boards in six of seven of the last games. 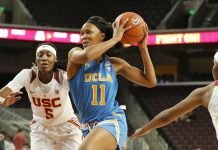 She is stepping up when teams routinely double- and triple-team Billings in the post, and has made a big difference for the Bruins. Hayes, who along with Canada, Billings and Drummer were part of UCLA’s No. 1 2014 recruiting class, has made more three-point shots this season than in her previous three years. Having her as a scoring option when opponents are trying to stop Canada has been an asset. 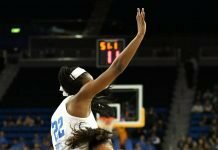 Freshman Michaela Onyenwere has also stepped up for the Bruins over the last month, and was a double-digit scorer in both games this past weekend. The Colorado native has more offensive than defensive rebounds on the year, and was named Pac-12 freshman of the week Monday. Oregon sophomores Sabrina Ionescu and Ruthy Hebard both eclipsed 1,000 career points Sunday – Hebard, on her second perfect shooting day of the season. Neither have second-year player demeanors and Hebard, in particular, has been improving game-by-game. 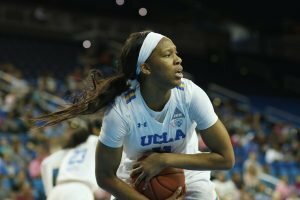 But UCLA’s seniors, who have been to two Sweet 16’s after winning the WNIT, have settled into a steely-eyed “last stand” mode. Stanford ends their regular season on the road, facing the Washington schools, while Oregon travels to the Arizona schools. 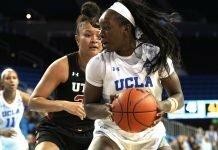 UCLA hosts Colorado and Utah. The Pac-12 Tournament begins March 1.